Rick Moore and Donnelly Fenn are very glad to announce that the digitization of the 4 two-record album sets from ’68 – ’71 are nearly completed. All 100+ songs are now on one CD as MP3 files. Contact Rick Moore at: clarickmo5849@charter.net for payment & delivery info. Or message me on FB that you are interested and want to be part of making this happen. Several singers from those years already have contacted Rick to request copies. Our original recording engineer, Wes Dooley of Audio Engineering Associates in Pasadena, has digitized and cleaned-up the recordings to the highest quality standards. All proceeds collected will go entirely to cover the cost of digitizing and distributing the music to those persons that have contributed, with any addition monies contributed to the WHS Choral Music Program. We need your help to pass the word along to those with whom you may still be in touch. "Just spent a wonderful morning listening to the CD I just got of the 72 and 73 recordings, and sharing it with my daughter and granddaughter. I thought it was just my imagination and fond memories.as to how good our choir and choral groups sounded: but my daughter just keeps saying, this is so good, these voices are so beautiful. 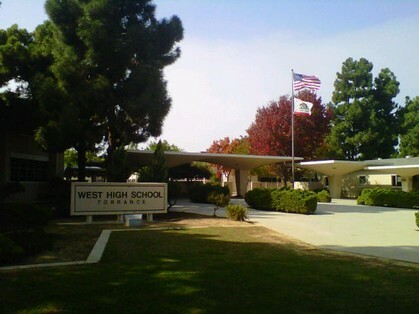 Thanks again for the memories and all you gave to all of your students at West." Opened in September, 1962. (45 acres obtained in 1959 for $703,000). Additions in 1963, 1967, 1968, 1974. Reinforced concrete, 240,562 sq. ft., 9 buildings, 92 classrooms. Serves area bounded by 190th Street, Hawthorne, Sepulveda and west city boundary. Peak enrollment: 2,692 in 1976. Solar gym and other additions completed, 1976 at cost of $1,308,000. Salty breezes sweeping o'er us. Cries of gulls and terns on high. On the far horizon lie. Staunch defenders of West High. Shawn Munson, West High Class of 1974 is gravely ill. Below is a post from yesterday August 1, 2018 written by Vivian Munson, Shawn's wife. I believe there are many old friends of Shawn's who may not be following his Facebook feed so I'm re-posting this. I'm pretty sure she'll be good with that. Shawn has always been a passionate Warrior, and was a top athlete in Football & Baseball at West. Prayers for Shawn and his family are appreciated. "Good morning all my FB family and friends, really don't like to use FB for this kind of communication, but for those if you who do not know, my husband Shawn Munson was diagnosed with tonsil cancer which spread to his neck. He received his first chemo treatment on 7/13, then a week later he got severely sick. Took him to ER; was severely dehydrated, blood sugar 510, rapid heart rate....long story short, what was suppose to cure him is killing him. The chemo gave him an infection in his colon which went into his blood stream which made him sepsis and put his liver into shock. Chemo killed almost all of his white blood cells. We thought he might pull through this because his numbers were getting a little better, but they gave him a swallow test after taking him off intabator he started aspirating the water. The doctor said that he needed to get nourishment in his body and they were going to give it to him orally, but since they could not do that, with other patients they usually put a feeding tube or intravenously but both ways would have killed shawn sooner because the infection would have latched on or he would have bled out 😭. So the docs said there was nothing they could do for him. 😭😭😭. Everything happened so fast, I know I am still in shock. But now I am keeping him comfortable in a nursing care facility until his organs shut down. He is fighting so hard to stay with us, but soon his heart will stop. I am sorry I cannot keep up with all the calls, texts and FB posts. I have some amazing friends and family that are helping me including Jennifer Renee Saari, Shawn's beautiful daughter. I will let everyone know about the services etc. Shawn was so proud to have served his county in the navy, so he will be cremated and placed at riverside national cemetery. Date, time etc TBD. Love all of you! Viv 😭💔💔"
For those West High friends that couldn't attend Allen Scott's Memorial service, I just want to pass on that it was beautifully set up and presented. One of Al's nephews is a Pastor at the church it was held in, so he inspiringly led the service. Both of Allen's brothers spoke with interesting detail about his life from birth to the final moments. It was emotional and heart wrenching as expected, yet also funny at times too. Al was such a dynamic larger than life personality, so how could there not be some humor and fun at his memorial! Most of all it was touching to learn how close and dedicated he was with his sister and brothers along with their families. Clearly Al was the cool & fun uncle! In the large greeting room in front of the church itself was the most amazing photo & memorabilia display of Allen's life I've ever seen for anyone. From birth to his last year there must have been more than 1,000 photos, plus an entire large book of his time at West High alone. What a terrific walk down memory lane! Several West High classmates attended and it was great seeing them after about 40+/- years Cory Hons & I guess it's been. It was pretty impressive that pretty much everyone recognized each other despite all the decades gone by! 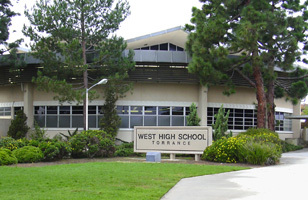 A few of us Warrior alumns talked about having a "Toast to Big Al" at a local Torrance tavern in the next month. Not only is it an opportunity to get more of Al's old friends together to remember and honor him, since I'm also posting posting this on the West High Alumni sites - even those that didn't know Allen well will surely know others that attend. It will be very informal and casual. We're thinking the Sports Harbor on 190th St. near Anza (it used to be the Anza Inn and has been remodeled, but still feels like the modest taverns from our youth). It being so close to West High seems appropriate too. We're certainly open to any other thoughts or suggestions, and definitely will appreciate feedback on interest level. It would be a great problem to have if we needed a larger venue! I am looking for a picture of a 1965 or 1966 ID card. I would like to use the template for name badges I am making for the '65 fifty year reunion coming up on August 14th, in Redondo Beach. I am running short on time so if you could let me ASAP I really would appreciate it. It is with sadness that I write to you to add to the site that Pamela Morelli Pagel has passed away on September 23, 2016 in Colorado Springs, CO. Survived by her husband Roger and her 3 boys, Tyler (24), Stephen (21) and Christopher (17). A missionary who graduated from West High school has been released from North Korea with another American detainee after a secret trip to the reclusive communist country by President Barack Obama’s national intelligence director. My beautiful and beloved sister Lynne Lester passed away in her sleep this morning. Lynne's spirit and amazing attitude throughout her battle with cancer was truly inspirational. Lynne was the class of "77" ASB President. She was one of the hardest working people I know and won awards for her work in the media industry. Her friends and colleagues are numerous and supported Lynne with love and affection throughout her battle. I am so lucky and proud to have been her brother. I am heartbroken that she is gone and miss her immensely already. I see her spirit and love for life in my kids whom she loved so much as if they were her own. God Bless my sister and may she rest in peace. Sadly Mr. Kreiswirth passed away on 9/6/14 according to his obit in the Daily a Breeze. An amazing artist and teacher! Sir Elton John purchased his artwork for himself as a birthday gift! Does anyone know who is incharge of putting the Archive together for the Friday night gathering? I've found some stuff from the 1960's (handbook, Pics, Warrior Ways) that I could mail to be displayed if interested. Contact me. Just a note to all of you who I was able to connect and talk with at the "50th". Trish and I had a great time, and it was such a joy to see many of you again after this many years. I wished that I would have been able to talk with more of you. The Friday night sing-a-long with Mr. Fenn was so much fun, and it brought back so many memories, and was a great reminder of why I chose music as a career and why I love to sing so much. Thank you again, and I hope to see you soon (maybe 5yrs from now). One question; Did we have a "fight Song"?